Considering that just about every company of every size sends email to its customers, this post probably applies to you. Do you need design inspiration? Ideas for how to make your emails look snappier, with more compelling layouts? Do you want to keep tabs on your competitors? What emails they are sending, and when? Do you want to monitor the email behavior of an industry? To determine what trends exist in marketing, offers, timing, and sequencing of emails? If any of those appeal to you, I recommend you check out Emailium. A free (for now) search engine of all the top emails from leading retailers, political organizations, and other major senders of digital communication, Emailium is the James Bond of inboxes. You can also combine these criteria to narrow your search results. When you find emails that are of particular interest, you can tag them for easy sorting and retrieval later (sort of like Delicious). 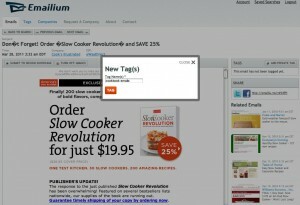 The emails catalogued by Emailium are by no means complete, however. This isn’t a Google equivalent, and you won’t find every email in the world in there. But, from a competitive analysis perspective, if you want to keep tabs on your arch-nemesis but Emailium doesn’t have their emails in the search engine, you can request the company to be added and Emailium will subscribe to the emails and add them to the database. The results can be a little off at times. A search for The Home Depot returned many emails from other companies with “Depot” in their names, in addition to the desired emails from the home improvement kings. Once you get into the email detail screen, quite a lot of interesting data is presented including company name, date sent, email provider, a list of related emails (shown with thumbnails), and the option to tag and/or share the email via Twitter or Facebook. Emailium founder James Paden says they’ll be adding many more data points in the future, including open rates and click-through rates, which would be very interesting information indeed. They’ll be out of beta eventually, too, at which time fees will be charged for Emailium access. Hopefully, beta users will be grandfathered in at some level, so I recommend you set up account in the near future just in case.